GEMMA is the latest in a series of geospatial projects from the Centre for Advanced Spatial Analysis, here at University College London. We are experiencing a massive explosion of online geospatial data from many new and unconventional sources from mobile devices to crowd-sourcing tools. Combined with newly released public sector information, we desperately need to integrate our tools for unlocking, exploiting, understanding and sharing these new data sets so that users can be provided with an accessible gateway to their display, mapping and spatial analysis. Funded by JISC, GEMMA aims to produce a single workflow for the collection, mapping, preservation, sharing and visualisation of the geospatial datasets. What does that mean in short? The ability to create a map without knowing anything about mapping. Simple as, for too long creating a map has been too complicated, there is now a vast amount of geographically tagged information available online, yet to map it you still have to have a considerable amount of computer related knowledge. Not any more, and we are not talking standard pin type maps, we will enable complex spatial mapping to be carried out at the click of mouse and a point at a file. This is what geospatial mapping should be, GEMMA aims to bring ‘geo’ to the masses and not in a ‘neogeo’ type way, simply find some data, make, mix and display a map, that’s GEMMA in a nutshell. 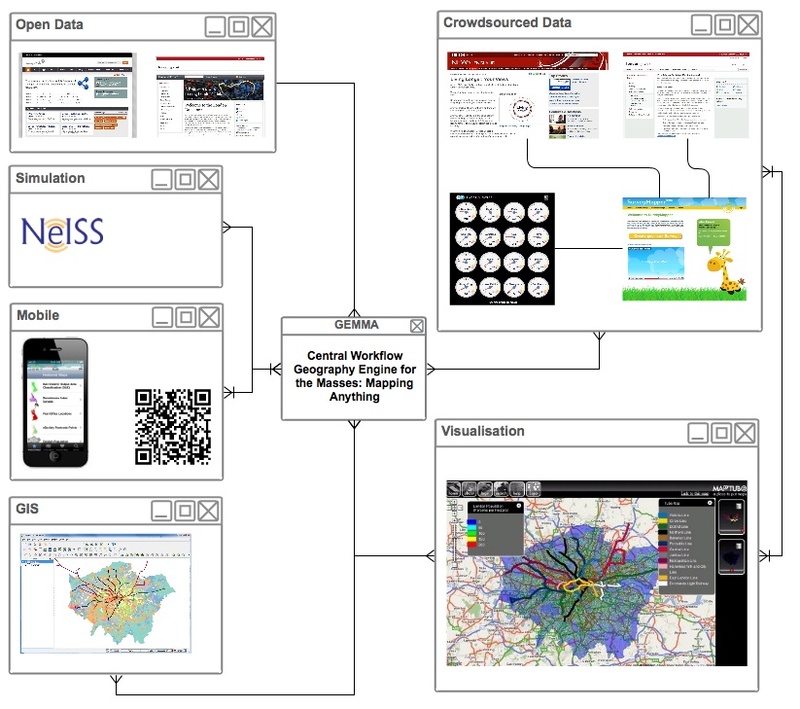 With applications as wide ranging as community participation, social simulation, economic analysis, urban modelling and beyond, the collection, visualisation, analysis and ultimately understanding of these datasets requires new software organised around a new series of workflows which integrate an array of tools. Over the next 8 months we aim to produce a one stop shop for any user who wishes to take public sector, crowd-sourced, mobile and related online data with geospatial reference which enables them to display and overlay this information in non-proprietary or freely available mapping services on the web such as Google Maps or Open Street Map, building on several tools that CASA has developed such as, MapTube and SurveyMapper. In typical CASA style, we will have frequent updates, beta releases and online apps. GEMMA will be integrated with various crowd sourced and open data sources complete with both iPhone and Android applications for viewing and collecting data in the field. GEMMA kicks off March 1st, 2011, its time to make geo easy…. What is a neogeo type way?